Don't understand this... see News Article below. The Lawyer lost the case so this guy went to jail and lost his job, but still charge him legal fees amounting to $38,000. The Lawyer should have known the chances of wining is zero and not taken the direction that he took. I don't know the Law, but I am very sure that the lawyers fees for this case of graft did not have to be so expensive. Even if this guy insisted on going on with this case, the lawyer could have refused to proceed. I'll have to speak with a lawyer to understand this... but I'm afraid to... because it may cost a $38,000. This is not a laughing matter... this is a joke. SINGAPORE - The man accused of murdering the wife of his former lawyer in his office in the Afro Asia Building four years ago kept his legal and financial troubles away from his children, the High Court heard on Thursday (Oct 22). 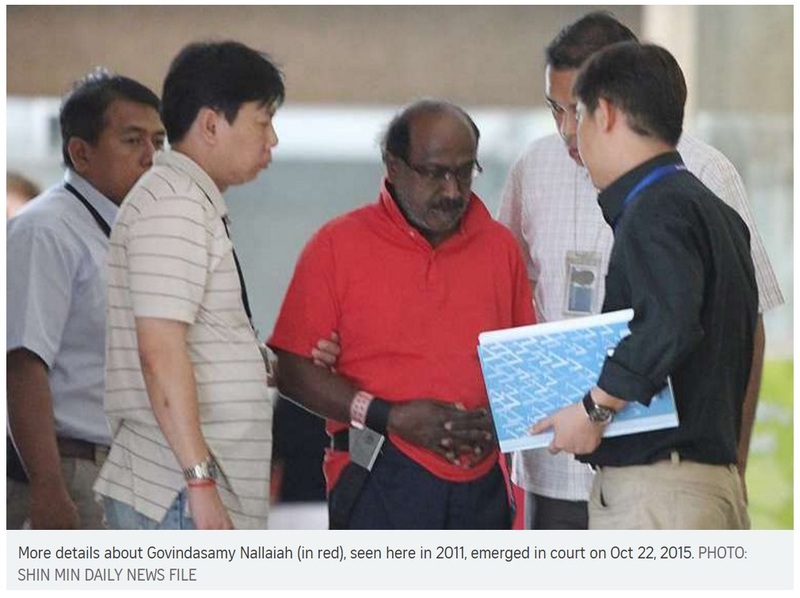 More details about Govindasamy Nallaiah, 70, emerged in court as his three children, a son-in-law and a family maid took the witness stand on the third day of the murder trial. The prosecution alleges that on Aug 10, 2011, Govindasamy, angered over a legal fee dispute lasting almost a decade, took a bicycle chain and padlock from his bag and hit Madam Low Foong Meng, 56, on the head until she collapsed. He then purportedly used a lighter to set alight some files on a table, then watched the fire spread before leaving Madam Low unconscious inside the burning unit. On Thursday, the court heard that Govindasamy was a Customs officer for over 30 years when he was investigated for graft in 2002. He engaged Madam Low's husband, lawyer Rengarajoo Rengasamy Balasamy, to represent him during the trial, but never settled his legal fees. His eldest children, daughter Letchmi Ghandi Govindasamy and son Ramanathan Govindasamy, both civil servants at the time, stood as guarantors for the fees which amounted to $25,000. But the children told the court they did not know what their father's corruption case was about. After his conviction, Govindasamy was sacked and had his retirement benefits terminated. He became a taxi driver after he came out of prison, working seven days a week. He also sold his private property at 24 Casuarina Road below valuation in 2005. Later, with his wife and their younger son, he moved into his daughter's Jurong West home. She lived with her husband, their daughter and a maid. When she and Mr Ramanathan started getting letters from Mr Rengarajoo's firm, indicating that legal action would be taken to recover the outstanding fees, he reassured them that he would settle the matter. Sometime in late 2010 to early 2011, Ms Letchmi Ghandi offered to pay the $38,000 owed. But her father stopped her from doing so, saying that a legal action had already been taken against her. In July 2011, Mr Ramanathan also went to see Mr Rengarajoo as he had received a letter indicating that his law firm would be proceeding with a Writ of Seizure and Sale. He offered the lawyer $10,000, with the remainder to be repaid in instalments, but this was rejected by Mr Rengarajoo. Mr Ramanathan later got a letter stating that if full repayment was not made by Aug 10, the lawyer would proceed to take a writ of seizure against the former's home. When Mr Ramanathan scolded his father for getting him into trouble, possibly losing his job, Govindasamy told his son not to worry and said he would find a way out. seen here in 2011, emerged in court on Oct 22, 2015.